Mid Sussex has many excellent walks. Much of the northern part of the district is in the High Weald Area of Outstanding Natural Beauty whilst the southern most part is in the South Downs National Park, including famous landmarks, the Jack and Jill windmills and Devil’s Dyke. The High Weald offers classic English countryside, and there are several botanically rich gardens in the region – Nymans, Wakehurst Place, Borde Hill and High Beeches. In our beautiful country. there are many breathtaking coastal walks, the wonderful sites of 1066 country and ancient woodlands to explore. On this section of our site, we have provided information and links to various walks and walking clubs in Sussex to meet the needs of walkers of all ages and abilities. We hope you enjoy exploring the beautiful Sussex countryside! The Disabled Ramblers exists to help mobility-challenged people get back out into the countryside. Able-bodied helpers support members by loading scooters and other jobs. They ramble in all weathers and over a variety of terrain and their rambles are graded according to difficulty. A few are suitable for shopping buggies and power chairs whilst most need large scooters capable of travelling over rough ground. To visit this website, please click here. Mid Sussex District Council have produced a series of 7 gentle walks around Haywards Heath highlighting local history and places of interest. To view the links to these walks, please click here. Copies of these leaflets are also available at the Town Hall. John Harris, who produces a website on walking in England, has produced a section with downloadable walks in Haywards Heath, from pushchair friendly walks to the more challenging. The website also features a sections on walking in and walking clubs in Sussex. To visit this walking website, please click here. The Mid Sussex Ramblers (MSR) are the Mid Sussex Group of 'the Ramblers' Britain's foremost walking charity. The Group was formed in 1973 and currently has over 480 members. They offer a varied programme of walks throughout the year to suit all ages and walking abilities. Walks are arranged on most Saturdays and Sundays, Tuesdays and Bank Holidays, with half day walks of 3 to 6 miles and, for the more energetic, all day walks of 10 to 12 miles. During summer months members enjoy Wednesday evening walks of 3 to 5 miles. During the winter months they hold indoor meetings in Haywards Heath, with illustrated talks on a wide range of topics and social evenings in local pubs. For more information on the Mid Sussex Ramblers, please click here. The National Trust have produced a section on downloadable walks in Sussex, including stargazing walks, romantic tambles, beach side walks and pub trails! To visit this site, please click here. They have also produced a wondeful section on Winter walks to help you walk the County all year round! To visit this section of the National Trust website, please click here. 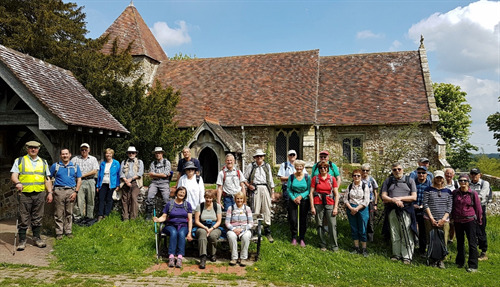 Sussex Pathfinders are an independent club of around 200 local people who share a common interest in walking for pleasure in the Sussex countryside. We have an all-day circular walk, typically of 9 - 11 miles, every Sunday all year round and shorter half day walks on most summer Saturdays and some winter Saturdays. For more information on these walks, please click here. Sussex Area of the Ramblers was formed in 1976. Membership stands at around 3500, with nine local groups throughout Sussex, and one county-wide Young Walkers group and the Sussex Young Walkers group. They work on behalf of walkers to protect the network of paths, safeguard the beauty of Britain's countryside and campaign for greater access to open country. For more information on Sussex Ramblers, please click here. The Mid Sussex Park Rangers run a free programme of Healthy Walks across the District. The walks are designed to help you get fit, explore new areas of the beautiful Mid Sussex countryside and to help you get to know other like-minded people in a safe and supportive environment.​ There are different levels of walks depending upon your level of fitness and all are welcome to join in. To find out more about these led walks, please click here. West Sussex info has produced an excellent site about walking in West Sussex, including the Downs, Rambling and the National Trail. To visit this site, please click here. West Sussex County Council has produced a booklet on Easy Countryside Trails in West Sussex comprising walks suitable for all including wheelchair and pushchair users, families and less mobile people. Please click here to access this leaflet. Haywards Heath and District U3A has a walks group that meets monthly on Mondays, Wednesdays and Fridays. These are local walks taking around two hours with a break. For more information on these walks, please click here. For the really serious, the Sussex Long Distance Walkers have much lengthier walks. They organise walks and events in East and West Sussex. Walks vary in length but are normally beween 10 and 25 miles depending upon the season. They offer a challenge and the opportunity to explore new areas and meet new people. To join one of the walks or find out more information about the Sussex Long Distance Walkers, please click here.